Denticon ideal for group practices seeking a unified practice management system across multiple locations. Founded in 2004, Planet DDS is one of the industry’s pioneers in providing a purely cloud-based dental practice management software. Whereas many traditional dental software companies have only recently begun to develop their cloud-based offerings, Planet DDS has been developing their solution on the cloud for over a decade, making their flagship software, Denticon, one of the most mature, full-featured cloud-based practice management software solutions on the market. Is Denticon the right software for you? Denticon by Planet DDS is a leader in cloud-based dental practice management software. The software is designed to address many of the specific challenges that multi-location dental groups face, so it’s particularly useful for enterprise practices / DSOs that are looking to unify their practice management software and reporting systems. Denticon is a powerful asset that can be leveraged across each of your offices. It’s designed to scale as you add new offices to your group practice, so that you can focus on offering the best care to your patients, rather than maintaining complicated technology infrastructure or dealing with legacy PMS solutions. Monthly subscription fee, without any upfront licensing costs. Contact Planet DDS for a quote. According to a study by the ADA, the group dental practice business model has become increasingly popular over recent years. This trend is expected to continue in light of regulatory changes and the rising costs associated with running a solo dental practice. Denticon was specifically designed to meet the unique needs of these group dental practices. As group dental practices grow and acquire more offices, they often inherit multiple versions of legacy desktop-based practice management software. Since each system stores its data in different formats (or may not even have the data of interest available in the first place), it can be difficult to generate and aggregate reports that provide a sense of composite performance. Using different types of legacy software across locations can also create more work for staff members. For example, if each location of a group practice uses a different type of practice management software, dentists who work across multiple locations will be forced to learn how to use multiple types of documentation and imaging systems. Furthermore, if each location uses a different scheduling system and stores patient data across different databases, dentists and staff will need to check multiple places to gain access to the information they need. Denticon was designed to help address these pain points by providing a consolidated web-based solution for every office in your group practice. Cloud-based software offers several advantages (both in terms of cost savings and convenience) over desktop-based alternatives. Because Denticon is cloud-based, you won’t need to manage expensive servers to store your data. Your data will also automatically be encrypted and backed up on a regular basis. All of these factors can result in significant cost savings, especially for group practices that would otherwise need to hire IT staff and purchase additional servers to manage their data infrastructure. Denticon also adds an element of convenience, since it can be accessed from anywhere with an internet connection, which makes it easy to check your schedule on the fly, for example. Upgrading desktop-based software can be rather cumbersome and often introduces bugs. Since Denticon is on the cloud, you won’t have to worry about managing software upgrades or installations on your local machines -- these will happen automatically behind the scenes on Denticon’s servers whenever they release software updates. Many large group practices may consider developing their own custom practice management software in-house. Though this can offer flexibility, as it allows you to make a solution catered to your exact needs, it’s important to keep in mind that this requires a significant investment of time, money, and technical expertise to develop a working solution that would rival existing software that has been iterated on for several years. In addition, there can be significant overhead that results from maintaining a custom solution across multiple offices. Though Denticon is primarily catered to multi-location dental practices, it still has a substantial number of users from solo practices and mobile practices. Currently, about 60% of Denticon’s users belong to multi-location practices. Denticon’s support staff has extensive experience in performing data conversions from virtually all PMS solutions, which can help make the transition process as smooth as possible. Below, we discuss some of the key features of Denticon, and how they can benefit your practice. Denticon really shines with its reporting capabilities, which enable enterprise practices to get a consolidated view of performance across all of their offices. As a multi-location dental practice, it can be challenging to aggregate data across your different locations, in order to identify areas of improvement or gain a clearer idea of financial performance. For multi-location practices that have acquired dental practices with legacy software, it can be especially difficult to compile the relevant metrics and aggregate them in a digestible manner. Various practice management software solutions store their data in different formats, or may not even provide certain metrics that may be of interest to you. Denticon solves this problem by collecting and storing all of your data across different offices in a standardized manner. As a result, you can pull reports across all of your offices, or by various segments of your choosing. 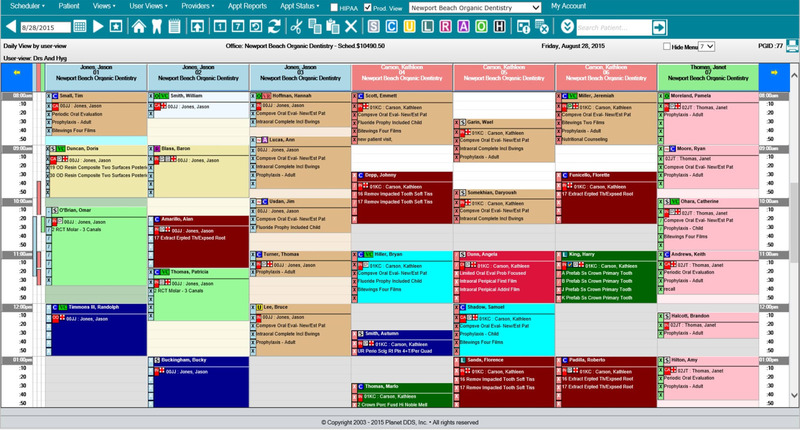 Another benefit to having a unified practice management software solution is that patient activity, as well as provider activity, is tracked in one central location rather than maintaining a separate patient or provider record for each location. For practitioners who work across multiple offices, it’s straightforward to pull a report that has all of their activity across all locations. This is important for groups that compensate their providers based on a percentage of collections, since it makes it easy to figure out how much to pay their dentists. Similarly, if a patient is seen across multiple locations, practitioners can easily access their full history of treatments, instead of having to pull reports from each location. Since Denticon is web-based, dentists and staff can access the software anywhere they have internet access, including from a mobile device. This flexibility is particularly helpful for users who want to be able to access their schedules outside of the office. But Denticon also offers additional security restrictions to ensure that users can only access data that they need. For example, you can specify that certain users can only access a specific type of information during limited hours of the day, or from certain IP addresses (e.g. it may not make sense for certain users to be able to access patient charts outside of business hours). The added benefit is that in the event that any of your physical devices (laptops or mobile phones) is compromised, you can restrict the settings so that sensitive patient data isn’t at risk. This is important, since loss of physical devices is one of the most common sources of data breaches and HIPAA violations. With Denticon, even if one of your physical devices is stolen, patient information will still be secure since it’s stored on Denticon’s servers, as opposed to locally on your devices. However, as soon as one of your devices is reported as being lost, it would be recommended to change your Denticon login credentials. Denticon provides an appointment booking widget, which you can put on your website or Facebook page, that enables patients to book appointments online. Patients can search for dentists within your practice, and schedule appointments with any available dentist. Other appointment booking software will enable customers to search for dentists outside of your practice, which can lead your potential patients to other dentists, resulting in lost revenue. Denticon will only direct patients to dentists in your practice, and will keep the user on your website, instead of driving valuable web traffic to other sites. You can ask new patients to fill out paperwork (patient health history, responsible party information, insurance information, etc.) online, so that when they show up to their appointment, you already have their information. This greatly improves the patient’s experience, and helps to reduce the anxiety of the registration process. When the patient arrives for their appointment, you’ll already have all of their insurance information ready. Outside of its practice management software, Planet DDS also offers what it calls “Virtual Business Services” (VBS), which is a pay-as-you-go service that enables you to outsource certain administrative tasks to one of Planet DDS’ expert in-house VBS agents. With VBS, you can outsource things like insurance verifications, insurance plan entry, fee schedule entry, claims submission, and claims follow-up. By outsourcing many of these tasks, you can reduce A/R days, and accelerate the cash conversion cycle. This service doesn’t require any long-term contract, and is billed on a pay-as-you-go basis with no minimum, which makes it a popular service around the holidays, or when offices find themselves particularly understaffed. Many customers like to use VBS when they first transition to Denticon, so that their staff can focus on the software transition, rather than dealing with these administrative tasks. Roughly 50-60% of Planet DDS’s customers use their Virtual Business Services in some capacity, either on a short or long-term basis. 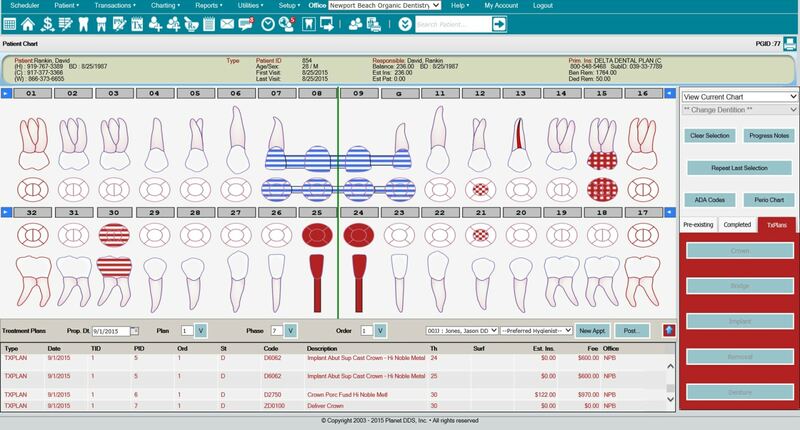 Denticon also offers additional modules to complement its practice management software. Some customers opt not to purchase these modules if they are using an alternative they already like. Dentiray is Denticon’s imaging module, which enables users to quickly send and access images in the cloud. It is compatible with over 96% of all imaging hardware. With Dentiray, you can tie Denticon to your hardware sensors and instantly send images to the cloud. Most of Denticon’s users opt to use Dentiray, but if you already have an imaging system that you like, you can use a bridge with Denticon. However the downside to creating a bridge with Denticon is that you won’t be able to access your images in the cloud. Roughly half of Denticon’s customers opt to use Dentigram, which is a patient communications solution that offers a powerful alternative to some of the other patient communications options on the market. With Dentigram, you can improve patient retention numbers by sending automated appointment reminders, as well as recall reminders when a patient is due for a return visit. Though this is an additional module, the resulting increased patient engagement can quickly pay for itself. Denticon is an industry leader in web-based dental practice management software. It’s designed to help meet the needs of group dental practices / DSOs with multiple locations. The software has all of the features you would expect from a complete practice management software, but it specializes in providing group practices with a unified view of their business by standardizing data collection and patient information across all offices. This is a particular pain point for enterprise practices, who often have several legacy practice management software in place across their office locations. Denticon offers a more convenient and affordable alternative to developing a proprietary system from scratch, which will require software developers and IT staff to maintain expensive hardware. If you are an enterprise dental practice that is looking for a practice management software that will scale with your business, then Denticon is one of the premier solutions on the market.